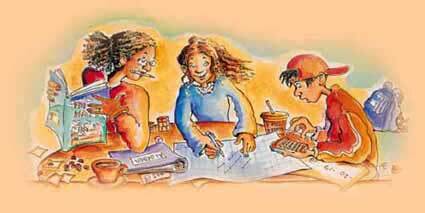 FAMILY MATH believes that all children can learn and enjoy mathematics. Parents and other family members are their children's first and most influential teachers. Yet many parents report that they do not know how to support their children’s mathematical learning. FAMILY MATH focuses on developing problem-solving skills and building a conceptual understanding of mathematics with hands-on materials. These materials are often found in the home. To talk with someone about the FAMILY MATH Program, please call call 510-642-1823 You can also contact FAMILY MATH Director, Karen Mayfield-Ingram, at 510-642-9082 or by email at mayfield@berkeley.edu. FAMILY MATH Class Leader Workshops prepare educators, parents, and community members to lead classes for families. A good mathematics background is helpful but not essential. Anyone who is enthusiastic, kind, and committed can become a FAMILY MATH class leader by attending a two-day workshop. These are given at the Lawrence Hall of Science or at your site. You will leave this workshop as an inspired FAMILY MATH class leader. FAMILY MATH Staff Development Workshops enable experienced Class Leaders to prepare others to lead classes for families. Workshop presenters need a good quality background in mathematics. FAMILY MATH is a worldwide phenomenon. From South Africa to New Zealand and throughout the United States, families gather to learn and enjoy mathematics together. Check our Sites Network for the location nearest you.